A new look at tea through visual infographics, including mind map, flowchart and tree diagram. Make infographics to share ideas in powerful yet easy to use diagramming software. What tea to Chinese people is what coffee to American people. It is not just a kind of beverage but also a symbol of Chinese culture. Learn more about tea from new perspectives through infographics. According to the making process and color of liquor, tea can be divided into several classifications. Such categorization can be clearly displayed in a tree diagram. This tree diagram is characterized by auto generation and auto connection of shapes. By clicking the floating action button, you can easily generate more shapes. More tree diagrams are available in Tree Diagrams for Presentation. This mind map illustrates some of the benefits of green tea. Created by Edraw, the advantage of such mind map is that, its shapes are smart, which can adjust themselves automatically based on the contents. When you are adding more text, the mind map shapes of Edraw will enlarge automatically and vice versa. Similar mind map examples about health can be found in Infographics about Health. 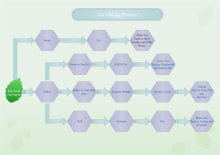 Presented on the right is a creative flowchart showing the steps of making tea. You can compare different kinds of tea in the diagram. To make more vivid diagram, rely on Edraw and you will gain stunning results. 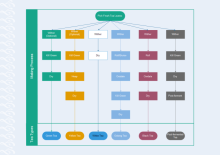 More nice and novel flowcharts can be downloaded for free from Flowchart Examples. You need to consider 3 factors to steep a perfect cup of tea: the water temperature, tea leaves amount and brewing time. Water is a friend of tea, and as such, water temperature is one critical factor in extracting the best flavor from your tea leaves. Each tea type calls for a different brewing temperature. Check out more details from the chart below. For hot tea, use 1 to 1 1/2 teaspoons (or 1 pearl). For iced tea, just double the amount. If you like your tea strong, add more. To dial down the strength, use a little less. Pu-erh tea prefers steep times of 3-4 minutes. The above graphs are all drawn by Edraw - a versatile diagramming solution. As you can see, information in infographics is clearer and more understandable. Edraw is an advanced diagramming tool enhanced with drag and drop interface similar with MS Word and pre-drawn templates and examples. Included are over 6000 shapes and more than 200 diagrams ready for use. Besides a diagramming tool, it can also be used as a drawing tool and a tool to design slides for presentation. Download it now. It is free for trial. Information communication is the priority.